These are just some of my thoughts and experiences on life. I have a deep sense that this life of mine would be very different if it were not for the grace that leads, goes with, and follows me at every moment of every day. Why in the world would we pray that our expectations and plans not work out in the way we would hope? Too often we work out our life without consulting God and then end up questioning God’s care for us when everything we participate in isn’t blessed. In praying a crazy prayer like Brennan’s we begin to move our hearts to a place that recognizes that being a child of God is a greater gift than a life where every situation runs smoothly, or where every outcome works to our benefit. Perhaps thinking that life should always work out to our benefit is crazier than actually praying that it won’t. We know that life doesn’t always work out as we would plan so why do we get so ticked when it doesn’t? I could tell you story after story of how things haven’t worked out as I expected, how my plans were seriously frustrated, and after the dust settled it turned out for the best. Brennan’s prayer isn’t all that different from praying, “Your kingdom come, your will be done...” However when we lift up Brennan’s prayer it is harder to deny the daring truth behind the words. His prayer also recognized that if we can let go of the hubris that expects life will always work to our immediate liking we are more able to embrace the trust that can only come by being child-like in our faith. As this prayer seeks, such trust in God’s love can lead to a joy much deeper than the shallow contentment that comes from getting our own way. I find myself at a time of significant transition, that I neither expected or planned. I pray that I would find joy in trusting God is leading the way. Will you look for such joy in being led? Led in the wisdom that is beyond our. Led as a child whose parent is excited to take her on a trip with a surprise destination. Instead of worrying about not being in control, can we search for the joy found in taking God’s hand in the moment and finding a love that cares enough about our well being to not always give us our way? Where Is God When It's Hard? The scriptures are clear, God is with us when things get tough. But is our first reaction always to lean on that promise when life gets hard? I know that I have had some of my most powerful experiences of knowing God’s presence during times like these. And despite these experiences there are still plenty of times that instead of trusting the God that has always been with me, I find that I get upset that Jesus doesn’t care enough about me to stop the situations in my life that cause me pain. In Paul’s second letter to the Corinthians, he talks about having a similar experience which he only refers to as “a thorn in his flesh” and says he pleaded with God to take it away three times (12:7). The response that he gets is in verse 9, “My grace is sufficient for you, for my power is made perfect in weakness.” So while we don’t know what it is that troubled Paul we do find out that he went to Christ in prayer about the situation repeatedly, and the pain did not end. Jesus simply affirms that when we are troubled, that if we trust in the grace of God that we will have his power, and that will be enough. These are tremendous words that we would all do well to store away in our hearts for a difficult time, or if that time is now, to ask Jesus to help his grace be sufficient even in our greatest need. As we start 2010 and look into the unknown of what the year might hold for us, I hope we might all find the grace to not get upset will God when we have trouble. Beyond that, may these be times that we rest in God’s perfect power and not beat ourselves up about our weaknesses, knowing that we have the grace that is more than sufficient to meet all of our needs. When my grandmother pass away last year I thought a lot about the times I shared with her, one memory in particular kept tugging at my heart. Small in stature, with a fire in her eyes, this Irish-Catholic woman, was relentless when she was passionate about something. As one of her grandchildren I had the privilege of being one of the things in life that she was passionate about. However, I didn’t always see the way she expressed that passion as a privilege. One of the ways that my grandmother would bestow her passion on us kids was with a kiss. Sounds harmless enough, but her kisses horrified me from a young age. It wasn’t until age five that I finally couldn’t take the cold clammy cheeks that resulted from her sloppy kisses and started to wipe my face with my hand when she would turn away. Over time I grew in my boldness and would no longer wait for her to turn away, and in a mix of wit and affection she would say, “You may think your whipping it off, but you’re just rubbing it in!” This scene played out numerous times over the years, until I finally realized what a gift it was to have my grandma love me so much and as I touched my cheek one day after a characteristically wet kiss, as she exclaimed that I was whipping it in, I remember thinking that was what I was hoping to do. Thankfully I came to a place where I realized the love that was being expressed in her kiss, but there were a number of years when if I could have found a cream or a spray that would have protected me from the messiness of that love I would have used it. As we make our Advent journeys this year, my prayer for us is that we don’t allow the holiday hustle and bustle to be the force field that protects us from the love God wants to express to us in the mystery of this season. Emmanuel, the name means God is with us. And just as for those connected with that first Christmas, we will meet God in the places we would least expect if make room in our hearts to listen to the Spirit and follow where we are lead. Emmanuel, God is with us indeed, but will we notice or will we just try to wipe off his love? May we recognize God in our midst and take the opportunity this Advent and Christmas to spend some time rubbing the grace of Christ into our hearts. As you can tell from the topic, this post was written last fall. At the time I had a new computer and had issues with copying and pasting from my word processor. Even with the new baby now here I hope to start posting again more frequently. Thanks for coming back. Politics are such a mixed bag for me. On the one hand I love the way the political process works in our country. Those who put together our government and how it would sustain itself accomplished one of the most brilliant achievements in human history. On the other hand I hate how polarizing politics have become in our culture. I can’t stand the way that folks who would normally get along in almost every other way can end up down right nasty when politics come up. This is the major reason that I play it close to the vest in terms of my political views. As a pastor I would hate to think that my position as a spiritual leader may be compromised because of differing political views. That’s not to say that I lack conviction when it comes to my political beliefs, it’s just that communicating the Gospel that transcends politics is my main priority. Truth be told, I am usually just as disgusted with both our major parties, and feel that with any major election there is a mixed bag of pluses and minuses with the candidates I have to choose from. I have also seen this reality play itself out in each of our presidencies that I have witnessed since I started really paying attention in the early 90’s. Each president has accomplish amazing things while in office, as well as failing in ways that hurt our country and the world we live in. In fact the only reason that I have keep my registration with the party that I initially picked at age 18 is so that I can continue to vote in the primaries. I may even rethink that since I have yet to vote for a winner in any primary election that I have participated in. To complicate the process even further, as a Christian as I try and look at what the scriptures point to as important for a government and society to be about it seems unlikely that there would ever be a legitimately electable candidate that would fulfill all those requirements. The way that I typically handle political conversations with people from my church is to mostly listen. Rarely, if I am having a one-on-one conversation will I make a comment about an issue if it does not have a blatant scriptural point of view to be spoken for. This will often put me in the middle of some interesting discussions. I think that too often we feel the need to share our opinion on a particular subject that someone has brought up and we miss out on what may be some of the most amusing listening opportunities available in life. One of the things that I have observed in these situations is how many people will assume that if others agree with them enough to worship at the same church then everyone must also be of similar political views. You don’t have to see the variety of bumper stickers on peoples cars to realize how funny that idea is. Over all, will annoying as this all can be, and as sick of it as I am already becoming (with two more months of joy to come), I am glad that we go through this every four years as a country. It’s a time to re-examine what is important to us. It gives us a good snapshot of what is occupying the important priorities in our society. And it shows us that while we may disagree about somethings with every fiber of our being that we can all still get along and live in a country where the democratic provides a vehicle for the peaceful passing of power from one leader to another at least once every decade. With all it’s flaws we live in a wonderful country. My prayer is that this political season results in the type of dialog that regardless of who is elected will lead us to a place that makes our country even better. When Will I Be a Man? So I’m on vacation for a couple of weeks, and this first week I am local because Angie is working. 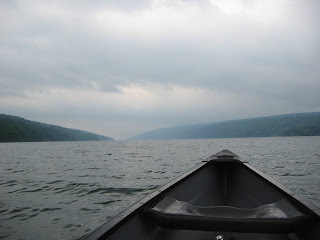 I decided about 10:30 last night that I was going to wake up wicked early and go fishing today on Hemlock Lake. It required me to do a little work before bed since I didn’t want to have to load the canoe and gear come morning. This was a good call, because when the alarm went off at 5:10am I was looking for excuses to crawl back into bed. Instead of excuses not to go, as I contemplated how comfortable my bed is, two thoughts hit me. The first was if I get back into bed after my alarm going off this early Angie will most likely kill me. The second was that I already strapped the stupid canoe to the top of my car so I might as well take it somewhere. I stopped near the lake for some gas station coffee and because there was a sign in the window that read, “bait.” While gas station coffee is a serious affront to my coffee snobdom, it just didn’t seem like a real man morning to brew Starbucks before fishing alone. I thought it a good idea to get some live bait since all my other attempts at fishing this year have led to me losing the lures I had on my line. I’ve always found it kind of gross that a place that primarily sells people food also sells fish food, but I guess most of what a gas station sells doesn’t really qualify for people food (I would like to see Morgan Spurlock live off that fare for a month). I felt good about the worm purchase because of the reassuring writing on the container. It told me that they were genuine “Canadian Nightcrawlers.” I’m not so sure why they are better than worms from the states, but if they came all the way from the Great White North it must have been worth the trip. The other thing that I liked about the packaging was the disclaimer, “Not meant for human consumption.” Since I wouldn’t be drinking on my aquatic adventure I didn’t need the warning, but I’m glad it was there. Hemlock Lake is amazing because there is no development around the lake because it is owned by the City of Rochester for a water supply. For this reason they also only allow hand propelled boats, and very small motorboats. All this leads to the sensation that you’ve stepped back 200 years in time because you hear almost nothing from other humans and rarely see anyone out there. As you can see from the view, not a bad place to spend your morning. It’s kind of hard to have a bad time when you have this lake as the backdrop for your prayer time, even if are technically there to fish and haven’t caught a darn thing. Which brings me to the question at hand: If real men are supposed to be able to do things like fish, do I officially have to have caught a fish to be a fisherman? I do think that I came as close as I have yet this morning as it’s possible that a fish or two chewed my worm off the hook without getting caught. But seriously, how hard can this be? I just want to catch a fish. Something, anything, I’ll be happy with a goldfish at this point. Well, fishing aside, I kind of took a step further toward manhood last night when I actually crawled under Angie's car and used my drill and those plastic pull ties to connect some shielding that had come loose. So I am making some progress, but keep me in your prayers. Even though we’ve bought and sold a house in the last couple of years I guess there are still some things in life that are blatant reminders that we are definitely, really adults now. Sure we’ve bought furniture before, but a piece here and a piece there, in fact we didn’t even buy our mattress and bed frame at the same time. So when we went out tonight in search of two matching couches, I guess I wasn’t prepared for the sense of responsibility that would come with the decision. Seriously, when you buy two couches that match you are committing long term to large pieces of furniture; furniture that will require me having to remember that the color of our living room for years to come. And if I am ever asked about my opinion on a different color for the walls in the living room in the next 15-20 years, I better have darn well thought out the implications of how that color matches with the couches (not because I really care, but because I am maritally challenged). That’s a lot for a man like myself to get a hold of. The thing that I can appreciate most about this adult purchase is the way that it expands our ability to comfortably host larger groups of people. That is a real plus, since the small couch and two chairs made it uncomfortable for entertaining even two other couples at the same time. Besides, it would be un-American to not go out and spend our Economic Stimulus Package immediately, right? Come on over some time after delivery and have a sit down on the new couches. They are rather comfortable (and they sure do match the blue walls nicely as well ;-) ). “Lord Jesus, thank you for who you are.” If you have even heard me give the children’s message at church you have heard me pray these words with our kids. You may have even wondered if you’ve heard me lead our children to pray like this week after week, “why can’t he think of anything new to start that prayer with?” Since I’m realistic enough to realize that it is unlikely that any child that comes up on a Sunday morning will remember the specific substance of a children’s message into adulthood I am intentional about teaching them to pray in this way. Maybe, just maybe, after starting prayer with their pastor each week in this way (I pray a short phrase and the kids repeat after me), that this will be ingrained in their prayer life for all their days. So with all the ways that one might attempt to teach children to pray, why “Lord Jesus, thank you for who you are?” Acknowledging who God is and our gratitude for that is to recognize what prayer is really about. Jesus promised as he left his disciples that the Holy Spirit would be with us always. So let us not think that in prayer we are summoning a far off God who comes close at our beckoning, or getting the attention of a God who is distracted by many chores and voices, and needs us to say, “Hey, God listen up, I need your attention right now!” Author Henri Nouwen has reminded us that all prayer is answering prayer. Meaning that God is already active and present in our lives (weather we recognize it or not) and in prayer we are answering what God is already doing. God starts the conversation, and when we slow down enough to pray we are simply joining in that conversation with the One that longs to share time with us. Starting prayer with thanking God for who God is also reminds us that our relationship with God is not that of an ungrateful child that always has a hand out looking for more from God. When we understand that the God of the universe wants to have relationship with us, that he loves us with more care, tenderness, and intimacy, than even the most perfect human parent ever could, we should not be able to contain our gratitude. Particularly as we realize that this relationship isn’t based on who we are or what we do, our good deeds or our eloquently crafted prayers, but simply on the fact that God loves us and has done everything possible to make sure there are as few barriers between us and him as possible. So to remember with gratitude who God is as we begin to pray is to acknowledge all God has done, will do, and is doing, and how that affects all we have done, will do, and are doing. Prayer is not about having the words exactly right, or saying them with a certain inflection, but the words should reflect the attitude of our hearts as we join in conversation with God. Perhaps if we start our prayer with gratitude for who God is that we will connect with what the deepest part of our souls already knows, that God is completely different from us and yet desires to be with us more than we could desire anything in our hearts. May we be filled with gratitude at such a God and never stop thanking Jesus for simply being who he is.